*RSVP required. Guests must check-in at the pre-game party starting at 5pmto receive their tickets. Are you a huge Giants fan? Want to share your passion with people new to San Francisco? SportsHosts is a new service offered by the Giants to connect big Giants fans and soon-to-be-Giants fans. 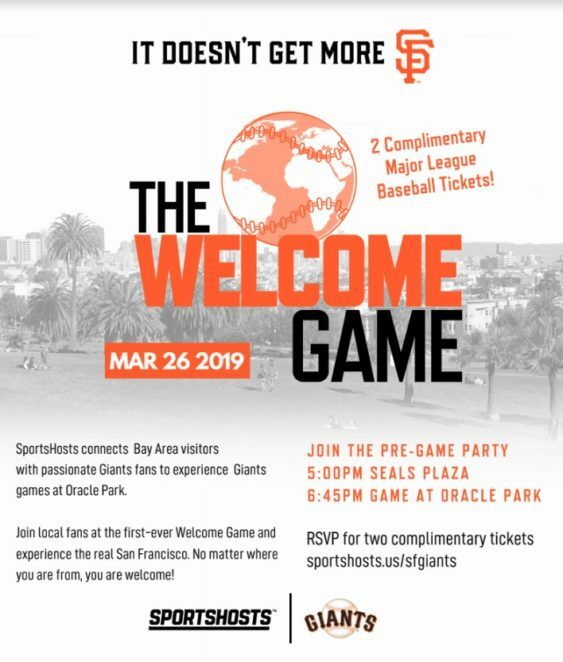 As part of their “welcome game” you can RSVP to get two free tickets to a special pre-party at Seals Plaza plus two tickets to the Giants vs. A’s game on Tuesday, March 26, 2019. Guests must RSVP to the link above and check-in at the pre-game party to receive their tickets. SportsHosts connects Bay Area travelers with local fans to experience live sports together.